I think its time for an update just to let everyone know what is happening with the server. We have had a great summer and our player base has grown loads. As you can see from the post below we hit 1500 online for the 1st time not to long ago. The plans we have so far are to upgrade/revamp prison. Then I think City Life is also due an upgrade. Then I think, instead of adding extra game modes, I’m going to spend some time working on the games that we already have to make them bigger and better. I will be fixing bugs and making improvements across all game modes. The staff apps have apps changed. They won’t be monthly like before. People can apply any time with the ‘Apply’ link at the top of the page and I will accept them as we need them. Thanks for reading and thanks for continuing to be a part of this amazing community! Also, in my new quest to make Bazzle the most famous doggo on Minecraft, I have attached a pic of him when he went to the beach and turned to sand. Those of you that saw at the time will have noticed that Blockdrop reached 1500 players online this Saturday. This is the highest amount we have ever had online. I remember only a few months ago when I made a post that we hit 1200 but now we can hit 1200 most days, even on a normal week day. Blockdrop is growing quicker than any other cracked server right now and we keep taking over competition all the time. The progress we make as a community is amazing and I made this post because I want to thank everyone who takes part in Blockdrop. I want to thank all of the players who join every day and make new people feel welcome and I want to give a special thanks to the people who hang around on the forums. You know who I mean if you are one of those people who is on the forums a lot, posting anything from hacker or bug reports to new ideas or even just posting funny or interesting things. We have a core group of really dedicated players who spend a lot of time on the forums and in game and I really owe these people a big thank you for being so loyal and sticking with the server. I also owe a big thank you to all of our donators. These people spend their money on the server because they like being here and this helps us pay for the bigger and better hardware that we need to host the server as it grows. As a community we should all be thankful to our donators. Everyone knows that I always say that it is the players that make Blockdrop great and that he's never been more true. I work as hard as I can on making a fun server but without players it would be boring. 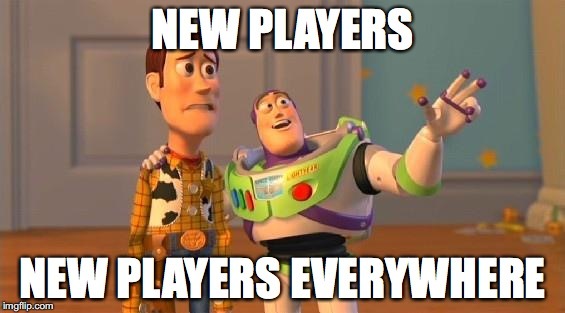 It is the players that create the experience that people get when they join the server and the fact that our player numbers are rising all the time means that new joiners want to stay. This shows just how great our community is. Heres to growing bigger again! and continuing to grow into the future, as a community! So after long anticipation we have the results from the staff apps. As usual I want to say, there was a lot of good apps, I wish we could have picked more but we can't train people that quickly. I do want to also say, I saw a lot of good apps that I really wanted to accept but could not because it was either for a server that we are not recruiting for or (the main reason) because the application was incomplete. So please remember next time to make sure the app is correctly filled out. Congratulations to everyone who was picked and if you wasn't picked this time then please try again next time as will be doing another recruitment soon. If you are disappointed about not being picked then remember, this is not the final chance. Remember that our most important value at Blockdrop is all of us working together as a community, this is something we do amazingly and everyone is just as much a part of Blockdrop as anyone else, we are a community and believe in treating everyone equal. Thank you for reading. Thank you for applying and thank you for being a part of Blockdrop!